Many companies offer a money-back guarantee because they know the majority of dissatisfied customers aren’t going to go through the hassle of actually returning the product to get their money back. We don’t play these games because we don’t have to, the quality of our products and services makes it unnecessary. If you order any of our products or services and don’t like it, just notify us and we’ll give you a prompt and courteous refund on the spot. No complicated forms or hoops to jump through. To protect ourselves from fraud, the It’s-On-Us guarantee is only valid for first time purchases of supplements, and redeemable up to three months after purchase. If you bought more than one bottle of a supplement on your first purchase and don’t like it, we would ask that you send the unopened bottles back to us for a refund because we can put them back into our sellable inventory. What if I told you that just about everything magazines and trainers teach you about dieting is wrong? What if you could build lean muscle and lose stubborn fat eating delicious foods that never make you feel like you’re “on a diet”? What if you didn’t have to obsess over “eating clean” to get lean and healthy? In fact, what if you could transform your body eating “dirty” foods each and every week? In short, what if I told you that using food to build your best body ever is much simpler and more enjoyable than you’ve been led to believe? You don’t need to eat boiled tilapia and steamed asparagus six times per day to build your best body ever. Once you know what you’re doing in the kitchen, you can use your favorite foods to transform your physique faster than you ever thought possible. Imagine…eating mouthwatering meals every day...never feeling starved or stuffed...having great energy levels and workouts...and watching your body change before your very eyes, dropping fat and adding muscle each and every week, like clockwork. The paint-by-numbers formula for creating effective meal plans tailored to your body, goals, and food preferences. The ground truth about how calories, “macros,” “micros,” food choices, and nutrient timing really affect your body and metabolism, and how to use them to get the body you really want. 13 delicious and easy-to-make breakfast recipes, like “BLT” Eggs Benedict, Heuvos Rancheros, High-Protein Banana Oatcakes, Spice Caribbean Oatmeal with Yogurt Swirl, and more. 11 mouthwatering salads and dressings, like Spicy Santa Fe Taco Salad, Grilled Mediterranean Salad with Sun-Dried Tomato Vinaigrette, Creamy Jalapeno-Cilantro Dressing, and more. 14 “diet-friendly” snacks that you’ll actually want to eat, like Blueberry-Coconut Pancake Batter Smoothie, Maple-Walnut Protein Muffins, Peanut Butter Protein Swirl Brownies, and more. 16 succulent beef and pork recipes that make great lunches and dinners, like Beef Stroganoff, Beef Lo Mein, Parmesan-Crusted Pork Chops, and more. 18 poultry recipes that you’ll love again and again, like Curry Chicken, Mexican Meatloaf, Pollo Fajitas, and more. 8 savory seafood recipes like Creamy Fettuccine with Scallops, Graham Cracker-Crusted Tilapia, Seared Cod with No-Cook Mustard-Caper Sauce, and more. 11 awesome side dishes like Crispy Squash Fries, Sweet Potato Chips, Roasted Garlic Twice-Baked Potato, and more. 10 delectable desserts that can actually fit your macros, like Peach Cobbler, Maple-Raisin Bread Pudding, Triple Berry Crisp, and more. 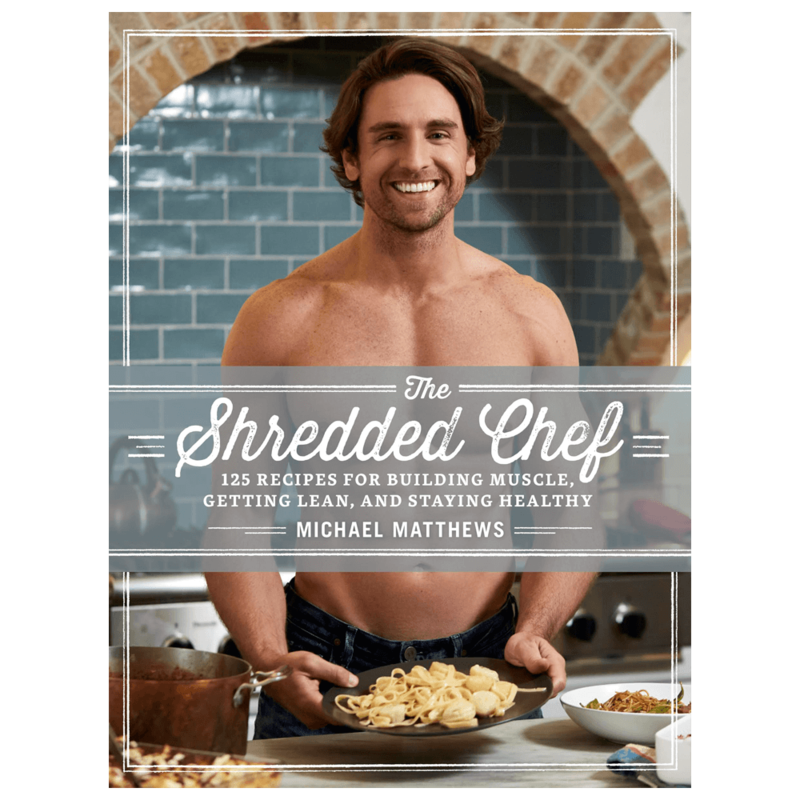 It’s 270 pages of simple, science-based diet advice and strategies backed by over 115 scientific studies, as well 125 of my favorite recipes for building muscle, losing fat, and getting healthy. The bottom line is you CAN achieve that "Hollywood body” without eating bland, boring, bodybuilding meals, and this book shows you how. All orders placed within the Continental US ship for free, and leave our warehouses within 24 hours (or less!) of being received. We'll email you a tracking number as soon as your order ships so you can follow along as it makes its way into your hands. In consideration of being allowed to participate in the activities and programs offered by M4L, Inc. and to use its nutrition programs and supplement and training advice, in addition to the payment of any fee or charge, I do hereby waive, release and forever discharge and hold harmless M4L, Inc. and its consultants, officers, agents, and employees from any and all responsibility, liability, cost and expenses, including injuries or damages, resulting from my participation in any activities, or my use of any programs designed by M4L, Inc. I do also hereby release M4L, Inc. its consultants, officers, agents and employees from any responsibility or liability for any injury, damage or disorder (physical, metabolic, or otherwise) to myself, or in any way arising out of or connected with my participation in any activities with M4L, Inc. I understand that M4L, Inc. and its consultants, officers, agents, and employees are not healthcare professionals. The services I have received from ML4, Inc do not provide or offer and are not a replacement for professional medical evaluation, advice, diagnosis, or treatment (“medical advice”). While ML4, Inc. believes that the information provided through our services and the site is current and reliable, ML4, Inc. cannot and does not make any such guarantee or warranty. I hereby agree that before using our services, you will consult your physician or other health care provider for medical advice, particularly if you are at risk for problems arising from changes in your diet or lifestyle. The services provided by ML4, Inc. are not intended to be used by minors or individuals with health conditions that makes the kind of changes to diet or lifestyle suggested by our services unsafe or inappropriate. Furthermore, I hereby understand that ML4, Inc. shall have no obligation or responsibility to monitor my health status or health condition or to contact or alert any medical or emergency professional. I understand and am aware that strength, flexibility, and aerobic exercise, including the use of equipment are a potentially hazardous activity. I also understand that fitness activities involve a risk of injury and even death, and that I am voluntarily participating in these activities and using equipment and machinery with knowledge of the dangers involved. I hereby agree to expressly assume and accept any and all risks of injury or death related to said fitness activities. In addition, I certify that I am 18 years of age or older. I do hereby further declare myself to be physically sound and suffering from no condition, impairment, disease, infirmity or other illness that would affect nutrient metabolism or prevent my participation or use of equipment or machinery except as hereinafter stated. I do hereby acknowledge that M4L, Inc. has recommended to me that I obtain a physician’s approval for my participation in an exercise/fitness activity or in the use of exercise equipment and machinery. I also acknowledge that M4L, Inc. has recommended that I have a yearly or more frequent physical examination and consultation with my physician as to physical activity, exercise and use of exercise and training equipment so that I might have his/her recommendations concerning these fitness activities and equipment use. I acknowledge that I have either had a physical examination and been given my physician’s permission to participate, or that I have decided to participate in activity and use of equipment, machinery, and programs designed by M4L, Inc. without the approval of my physician and do hereby assume all responsibility for my participation and activities, and utilization of equipment and machinery in my activities. I understand that all diet and training programs, nutrition and supplementation advice, and any and all other forms of information obtained from ML4, Inc. are not meant to treat or manage any health condition. I understand the need to consult with a healthcare provider prior to adjusting current lifestyle or eating habits or beginning any new diet and/or training plan. In addition, I hereby represent and warrant that I am currently covered by an accident and health insurance policy. With my purchase of products or services from ML4, Inc., I understand that results of any sort are not guaranteed and agree not to hold M4L, Inc. staff liable for any outcomes or a lack thereof. With my purchase of any ML4, Inc. products or services, I understand that they are only guaranteed to work in software designed for a PC computer such as Microsoft Excel. I understand that I am purchasing having known that beforehand and understand that using any other application besides Microsoft Excel might result in the products not working with 100% functionality.